Many know Kate Burton as an actress, most recently portraying the right-wing Vice President Sally Langston in the hit TV show Scandal, and in Grey’s Anatomy as Dr. Ellis Grey, the former surgeon and mother of lead character Dr. Meredith Grey, who dies of Alzheimer’s. Elizabeth Taylor founded ETAF in 1991 to support organizations delivering direct care and services to people living with HIV and AIDS, often to the most marginalized populations, according to their website. Today, Taylor’s friends and family work together as ETAF ambassadors to help keep the issue of HIV/AIDS “top-of-mind” for the public. Taylor’s trust covers the operating costs of ETAF, ensuring that 100 percent of donations go directly to people affected by HIV/AIDS. Following the devastation of Hurricane Katrina, NO/AIDS Task Force, the largest HIV provider in New Orleans, had no offices and its patients nowhere to turn. Taylor wanted to help, and through her foundation was able to provide a mobile treatment unit so that clients were able to continue to access their medications and other lifesaving services, uninterrupted. Taylor, understanding how successful the model was and that it didn’t need to be limited to a natural disaster, began to replicate it in other locales. She knew that chronic lack of access to healthcare was the biggest barrier in the battle against HIV and AIDS, according to a recent ETAF statement, and said, “If people cannot get to healthcare, why can’t we bring healthcare to people?” Since 2008, seven Global AIDS Interfaith Alliance/Elizabeth Taylor Mobile Health Clinics have been delivering care to the people of Mulanje and Phalombe districts in Malawi. Recently, in collaboration with the Elizabeth Taylor Trust and The Elizabeth Taylor AIDS Foundation, Getty Images Gallery in London produced “Grit and Glamour” to mark 30 years since Taylor first began her leadership in the fight against HIV/AIDS. Taylor’s son Christopher Wilding’s “major new photographic exhibition offered Elizabeth Taylor fans the chance to view previously unseen images of the Hollywood icon in a celebration of the British actress’ 30-year campaign to raise awareness on HIV and AIDS,” according to the Daily Mail. 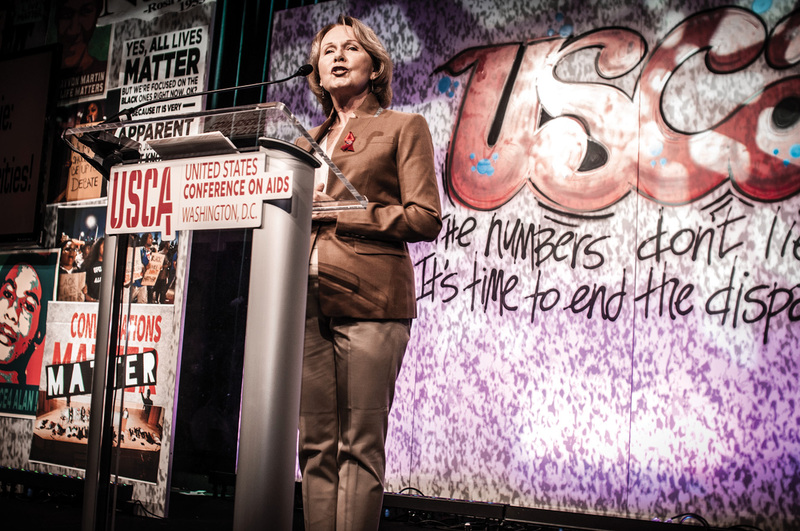 In February hundreds of HIV advocates from across the country will descend upon Washington D.C. for AIDSWatch 2016, the largest constituent-based HIV advocacy event in the U.S., to educate Congress about the policies and resources needed to end the HIV epidemic. ETAF is the lead sponsor. As for Burton, she says her advocacy for AIDS research and the search for a cure will continue throughout her life. Along with her work at ETAF she also serves on the board of Broadway Cares/Equity Fights AIDS.